There are over 300 wildfires burning in Alaska right now. That is so many fires that if you put pins for each fire on a map, it is hard to even see the map, as you can see below. With that many wildfires burning at once, some half million acres were consumed by fires yesterday alone. The metric everyone is watching now is whether or not two million acres will be burned before the end of June, which is to say, before the end of today. That metric doesn’t really matter for a couple reasons, the first of which is that we’ve already set a record for acreage burned this early in the fire season. The second reason is that what we are seeing in Alaska is not an event, it is a trend. 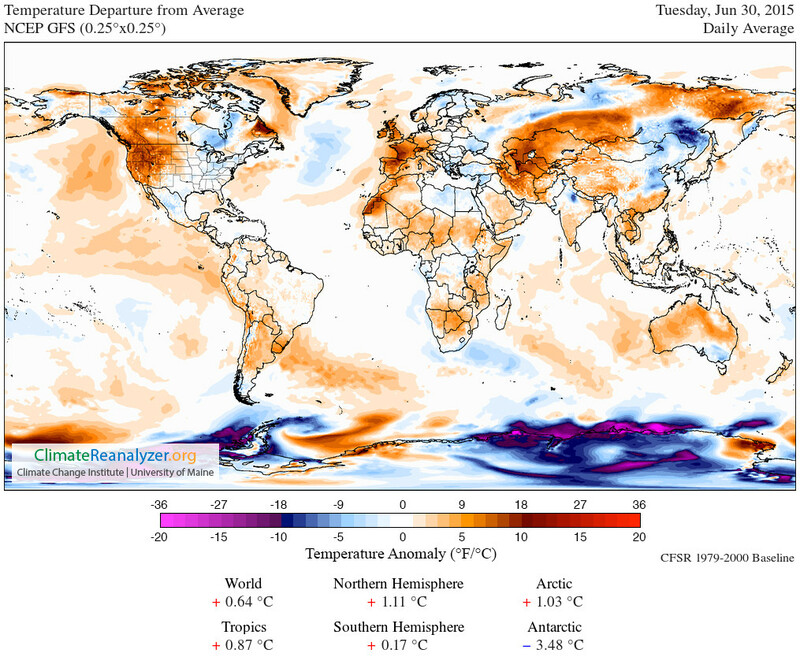 The trend is wide-spread and encompasses the arctic and sub-arctic region (the Antarctic, on the other hand, has gotten cooler while at the same time massively more ice is melting down there–but that is a different story). Looking at the Climate Reanalyzer graph below, which tracks global air temperature anomalies (at 2 meters above the ground), you can see the wide range of heat surges in the arctic and sub-arctic regions. We are seeing more wildfires over the decades (and certainly more in Alaska) and the fires are growing larger. Don’t think so? Check out the statistics page at Wildfire Today. As the Washington Post points out, not only is a dismal record being set in Alaska, but several feedbacks are being set in motion. Blackened ground absorbs more heat, which warms and dries more permafrost, which readies more fuel for fires, which adds much more carbon to the atmosphere, etc., etc. Take a look at the article here. All around us we see the signs of the effect of sin on the natural world. Those effects are increasing exponentially and they are already affecting human society. If the decay in natural systems is exponential, then the impact on human society will also be exponential: the final events will be rapid ones. 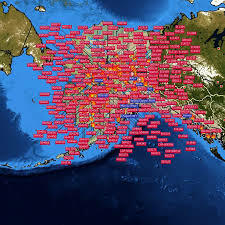 The fires are not limited to Alaska, Northern Canada and Siberia have been experiencing the same thing. In fact, the smoke from Canadian fires is so dense and so massive that its plumes are impacting much of the air in the central United States at this moment, while surging wildfires in Siberia are causing people there to relive the horror of massive, fast-moving fires that they last saw only two months ago. What we are seeing isn’t an event, it is a trend. A rapidly accelerating trend. Here in Southern Alberta, we are dealing with massive amounts of smoke from the west over 150 fires in British Columbia and from the east, 108 fires in Saskatchewan. There are no fires within a couple of hundred miles of us and we are staying indoors with the windows closed. It looks like London fog everywhere. If it continues to worsen “exponentially” only the Grace of our Lord will save us.